Yes there is now only a day until the restart of TigerTails Radio as Season 11 hits the Internet. There is now only mild panic here in the studio. Tasks for today involve sorting out the playlist, license details, and graphics for the songs; getting the YouTube feed setup, including creating the live stream event and doing all the metadata; setting up OBS with the stream details; and running through all the last minute checks to make sure things that need charging have access to power. Then tomorrow will be spent cleaning the studio and making it camera ready – and then we broadcast. Since it’s the weekend before the show, and things are now in full swing to get the show ready for Monday, here’s a couple of pictures showing where TK will be sitting and the buttons he gets to press! Pain or no pain, the show must go on. There is a lot of equipment that goes into running TigerTails Radio. This is mostly because the show has gained equipment over the years, and has bolted it on to the existing infrastructure rather than out-right replacing things. The only exception to this has been the microphones, as those have been upgraded – however, the old ones are still on hand for those unexpected moments of need. In fact, some of the equipment from Season 1 (back in 2004) is still in use in the modern setup. So, just how is everything connected? To answer that we shall have to know what IS connected, and what it all does. Let’s start with the consoles. Previously the consoles and the show’s camera were all linked to the LGP mentioned in a previous post via a series of HDMI switches. This has changed for Season 11. We now have a video mixer, which should mean a smooth transition when we play games on the show. The video feed is still controlled via a HDMI switch for the PS3/PS TV/Megadrive(+MegaCD+32X), but this switch gets fed into an HDMI upscaler to get it to 1080/60, which is then routed into the video mixer. The audio from the consoles is run into a series of switches used back in Season 1 and that gets sent into a new MP3 player and audio switcher. The camera for the show is on a switch with the Dreamcast (which outputs to VGA to HDMI, but this could be changed to route it into the OSSC with the Megadrive in future) and also runs into an upscaler, however while the Dreamcast audio routes into the same switches the other consoles do, the camera is to remain mute at all times. This is to prevent feedback during the show, as we use external microphones. The other things that connect to the video mixer are the Discord PC, and the PS4. These output at the required 1080/60 so didn’t need upscaling. The video mixer then outputs to the LGP and into the stream. For sound we have 2 mixers plus a switch. The switch is a Bluetooth MP3 player (meaning it takes SD cards, USB sticks, or Bluetooth) which has an additional 4 phono inputs. This handles the songs that are played during the show. They get fed into the main mixer and output to the LGP for syncing with the video feed. The switch also handles any extra audio from the video mixer, and the XP PC as well. Combine that with the audio from the consoles as mentioned above, and that’s all inputs taken care of. 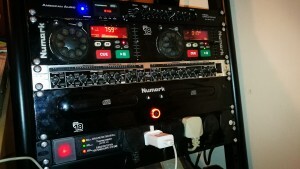 The secondary mixer takes care of the Discord PC and the backing music, along with the feed from the PC that broadcasts the video feed – but that remains mute during the show. As Xavier and the backing music need muting at the same time, it was decided to have them feed into the main mixer from the same input. However as the backing music is muted solo during the games, it meant that a mixer was needed. Thankfully we happened to have one laying around from Season 10. How handy. The main mixer is the one that does most of the grunt work. It takes the microphones in the studio, feeds them to a compressor and to the Discord PC so Xavier can hear us, it then receives the compressor’s output and mixes it with the jingles, the secondary mixer, and the switch before sending everything over to the XP PC for the Shoutcast feed and to the LGP for broadcast over YouTube. And that’s pretty much it. All the equipment that will be used for Season 11. Monday’s test show will ensure all the wiring is correct, volumes are set right, mics still work, and much more. There might be some live rewiring during the show, so advance apologies to headphones users. The next couple of days are the weekend, so don’t expect a massive post for each day to be posted – and then it’s the main event. There was going to be a post here about some of the hardware (other than the PCs) that powers the show. That was the plan. However, our website administrator has spent the day dosed up on morphine suffering with a kidney stone – so today’s blog post will be combined with tomorrow’s to tell how the studio was reformatted, and outlay setting everything up. With just 5 days to go, it’s time to delve a little deeper into some of the other more technical areas of how the show works. 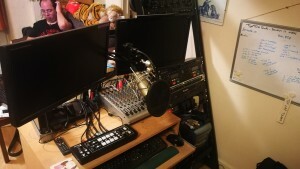 There are lots of other shows and podcasts out there that do things far more efficiently that is done at TigerTails Radio, but as the show is made from years of equipment building off equipment, I figured it was time to explain just how some of it works. This episode will concentrate on the PCs used. There are 3 PCs that go into make the show run. This is because the machines we run are old, and therefore can’t do the multi-tasking required to cover it all in one. Plus there’s software issues that would require us to have a minimum of 2 anyway. The first machine is an old Windows XP machine, which sends the audio over to the TigerTails Radio shoutcast servers. It runs XP as the broadcast software (which also records the podcast) won’t run on anything higher. The XP machine is also where the podcast gets uploaded into the archives for the website, so if regular listeners wonder why TK goes quiet on Discord immediately after the show, now you know – He’s working on a different PC. The Discord PC (as it’s known) is TK’s main PC where all the chat happens, and where Xavier dials in from his remote studio. The YouTube feed is also monitored from this PC, to make sure it’s all displaying okay. The YouTube comments and Discord channels are watched over from here, as well as Telegram, even though there’s no official TigerTails Radio room there yet (let TK know if you want one). The feed from the microphones goes into the Discord PC so Xavier knows what’s being said, and then it outputs his voice to the mixing equipment – which will be covered in another post. Finally there is the YouTube broadcasting PC. This takes the video output from the camera/games and feeds it into an AVerMedia Live Gamer Portable capture device where is it mixed with the audio from the mixers. This is then fed into OBS (Open Broadcast Software), which is where all the magic happens. The video broadcast PC is also where a lot of the graphics for the show are generated. OBS is then used to switch between the main video feed, music credit, and the game screens. However, with the forthcoming test show, that could be changing. In order to get the studio back up and running after everything was disassembled after Season 10, it was time for TK to get his room sorted. 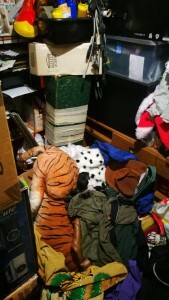 It had become a box-room of chaos so the boxes needed to be shifted, the contents crated up and storage lockered, and new furniture installed. This was a much larger task than anticipated. TK has a lot of stuff. As things were sorted, the studio area became filled with crates and assorted detritement, as seen from earlier pictures. Loads would go into storage only to be replaced by the next load within a day or two. Much to Hedgie’s distress. The task took most of December and early January, but eventually the room was clear enough to move furniture around to create space for a new wardrobe and an area for the CRT screens – there was still the PS2 LAN to think about. As TK has a bad back he sleeps pretty much on the floor under a table, so with a little help the drawers in the corner were removed and the table was shifted into the space. This created space for the new wardrobe. The drawers were then placed atop the table, which created the space to put the TVs on, with the consoles on the shelves of the unit. Stick a couple of bookcases in front, and a couple of stools to sit on while playing, and the new wardrobe in its assigned slot and the room is complete. 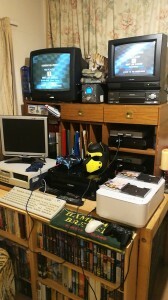 The great thing is having the four consoles in the room. Both original Playstations are linked to each other via the link cable. Both PS2 are also linked via both i.Link and Ethernet. At the moment the studio only has a couple of F1 games for the PS1 that support the link cable, but there’s some classic Wipeout that can be played when TK picks up another copy of each game, as well as Doom deathmatches. So that was TK’s room sorted. Now work could begin on reassembling the studio. More on that in another post. … And this is what it was transformed into. In the early days of TigerTails Radio, we worked with equipment that was a little… less than reliable, let’s say. Our main picture of TK and Hedgie looking worried at the microphone comes from an equipment failure that stopped our headphones working, with us cursing and swearing away unaware that the mics were working fine – and it was only a message from the listeners going “you do realise we can hear you, don’t you?” that clued us in. That was very early in Season 1. As that episode took about 20 minutes to play out, there’s been the on-running gag that we’ve got the first 20 minutes of the show to break things. When we started to get real equipment, it took some time to work out how to best configure it. So we did a pre-show episode, dubbed Episode 00. It wasn’t advertised but still gained a listener base. It was a chance to try things out, and to see how equipment worked. This started in Season 3 and worked well enough to happen again at the start of each season since. At the end of each season, the studio would be torn down, cleaned, rewired and set up again – thus making test shows an invaluable resource to make sure it had all be wired in correctly, and that all the equipment still worked. Season 11’s test show will be a chance for TK to lean how to use the new equipment, and how to bounce from each device when each segment comes in, especially the gaming segment. We have lots of bits now, so much we had to buy a rack (as much of it was rack mountable) to put it in. The main mixer is on the desk still, as is the video mixer (which is new). At some point, we might have someone who is competent at cable management to come in and make it all look pretty but at the moment it all should work. Should! This is why we have test shows. So, come tune in to the test shows. Watch us get the rust of presenting off as we slowly re-learn how to not talk over each other. Come see the equipment failures. It’ll probably be clunky, with dead air in places, and the sound quality might be off for a while. In other words, it should be a giggle. The penultimate Saturday before the start of Season 11. And as everyone is busy, this will be a short post – as will tomorrow’s. So let’s take a moment to give a shoutout to an unsung part of the TigerTails Radio equipment. It’s often overlooked as it’s not a big and expensive piece of electronics, but it serves a vital part of keeping the show running as smoothly as it can. And that’s the whiteboard. It is seen hanging up next to TK and contains the playlist for the show’s music, topical notes, episode numbers, and other bits and bobs which TK needs to be able to glance at while he’s busy doing things. Normally a day or two before the show, Hedgie will select the music for the episode, decide a playlist order, create the cards for OBS, and then update the whiteboard. This tells TK things like song name, artist, track number (and on which CD). We don’t normally stick to the playlist order, but we can do. While there is space in the show running notes for 6 songs, we have 10 songs collected incase we need to fill time for some reason. This is rare, but it’s worth having that option. Then at the end of the show, we refer to the whiteboard when doing the website’s song credits. So here’s to the whiteboard. The unsung hero of TigerTails Radio. The new jingles have arrived, and the new opening jingle will be the first thing heard in Season 11. Get excited! Following on from the post a couple of days ago, these have now been programmed into the app – which is now on revision 6! It has now run into an issue where the app no longer works properly on the Android device allocated to the jingles. You press the option – and then there was a good long pause before the jingle played. Thankfully, there is a better and more powerful device available, so who needs optimisation? Just throw more power at it. No screenshots this time, because of spoilers, but the new opening Jingle had Hedgie burst out with laughter. So there’s that. A couple of new jingles for new segments (including one that can cover the Quiplash slot for days we don’t play Quiplash), plus a couple of new jingles for breaks and plugs. These are what you have to look forward to. Be ready. As for getting rid of the Drama button… It has been replaced. RIP Drama button.